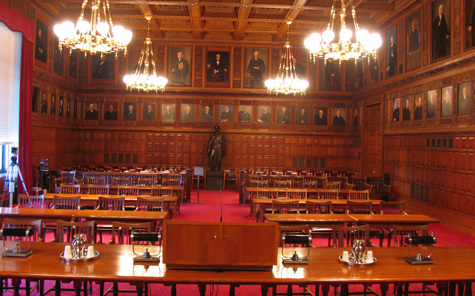 ALBANY, N.Y. (CN) – State judges who collect retirement pensions cannot also earn a salary for filling in on vacant bench seats, New York State’s high court ruled Thursday. Overruling a 2015 ruling, the Court of Appeals was unanimous that the state’s recent prohibition against so-called double dipping does not violate the state constitution or judiciary law. New York effected the rule in 2013, saying that retired trial court judges could fill in vacant judicial seats until age 76, but they must be recertified every two years to determine if they are fit to serve on the bench. While retired judges serve in fill-in roles, their pensions are suspended but not revoked. Attorneys for the three retirees who challenged the law appeared this past March for oral argument before the New York Court of Appeals. Case documents show that retired challenger Gerald Loehr is entitled to a $66,000 annual pension, while his co-plaintiffs, J. Emmett Murphy and William Miller, receive a $91,300 and $89,000 yearly pension, respectively. Their attorney, Robert Spolzino, tried to sway the court that the cost of paying a new judge’s pension could cost the state more than just allowing a retired judge to earn extra pay. “They are being paid for work they’re doing going forward,” said Spolzino. Lee Adlerstein, who represented New York’s Administrative Board of Courts, countered that some retired judges earn more than a $250,000 a year between their fill-in salaries and pensions. Agreeing with the board, the Court of Appeals wrote in an unsigned decision that certifying retired judges would hamper new judgeships and the “prestige” of the court system. One of the other key issues argued in March was whether double-dipping judges actually helped expedite the business of the courts. Spolzino, who recently joined the firm Smith, Buss & Jacobs in Yonkers, N.Y., did not immediately respond to an email seeking comment.